Is content marketing an oxymoron? After all if it’s a way of marketing then it must involve a transaction – because marketing is all about making and keeping customers profitably. Marketing communications have always included content. How many marketers want to run 30 seconds of blank screens, or a full page ad with nothing on the page, or a plain white website? Historically most marketing content appeared as paid advertisements. And it was written by professionals, instead of the amateurs who publish much of today’s digi-content. Marketers have been creating printed catalogues and newsletters for about 160 years. They also published custom magazines, white papers and information booklets. They held seminars. They ran user groups. And they’ve done all this for decades. So this idea that the creation of “content” is new — just because anyone can publish online for only the cost of their time — is extremely far-fetched. In most cases the alleged content marketing experts are self-serving bandwagon-jumpers trying to cash in on the gullibility of marketers. Shell Oil started publishing its famous Answer Man booklets in 1973, following a decade-long petrol brand campaign that was halted due to the Arab oil embargo. My colleague John Hancock wrote a number of these booklets. The oil companies decided to stop traditional product advertising during the oil crisis, so Shell published guidebooks about car maintenance and gave them away to customers. The little 8-page, A5 booklets were inserted in TIME and Reader’s Digest, and backed up with 30-second TV and radio spots. They also ran direct response press ads in magazines, where people could return a coupon indicating which booklets they wanted. In 1978 each book had $2 million in media supporting it. The campaign won a (US) DMA Gold Award, so it was considered ‘direct marketing’. In pitching new business, O&M Houston referred to it as ‘Corporate Advertising’. The real reason it ran was ‘Brand Advertising’. Hancock says the campaign maintained Shell’s #1 share of the USA petrol market … without advertising petrol. Once again we see that because something is new to a digi-marketer, it’s not new to the world. Writing and publishing content in paid or unpaid media has been the core of all marketing communications since … well, since ancient Egyptians used papyrus for ‘sales messages and wall posters’ if you believe Wikipedia. A more authoritative history site claims the first ‘content marketing’ printed in English was a handbill offering prayer books in 1472. Mind you, if Shell published when the price of fuel was going to go up or down, it would be one of the most read pieces of content each week. Hi. 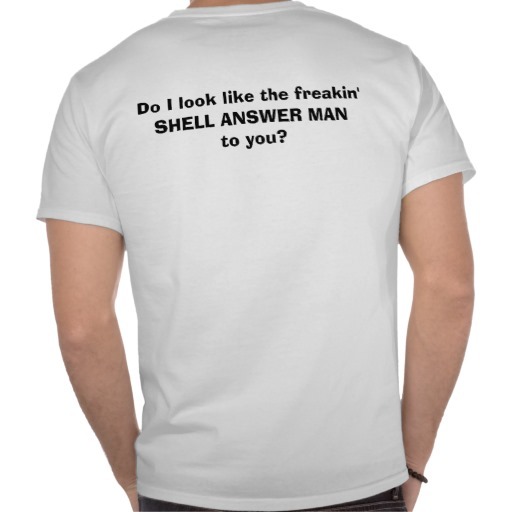 The Shell Answer Books campaign actually began in mid-1976. The campaign was created by me (Bruce SILVERMAN, then Creative Director of O&M Houston) and Exec Art Director, John Geyer. It won the David Ogilvy Award in 1977, the agency’s award for its best campaign that year. Please give my best to John Hancock who I hired that year.